Tour «The Connoisseur Of Russia». Cognitive travelling to Russia. 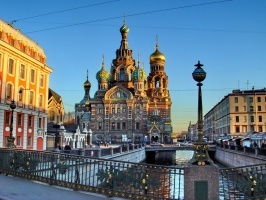 As its name suggests, this is our most comprehensive private Russian tour of Moscow, St. Petersburg and the Golden Ring. If you like to explore at your own pace and travel with a private guide this is the right tour for you. The tour includes all major sighseeing landmarks and allows plenty of time for optional activities. Our experienced tour guides will assit you through every step of your trip. They will help you to obtain performance tickets, make boat reservations, attend to personal matters if necessary, make restaurant and shopping suggestions and recommendations. Moscow City Tour is a general overview of the city and its main areas within the boundaries of the Garden Ring and the Boulevard Ring: Red Square, Kremlin, Kitay Gorod, Tverskaya, Arbat and Zamoskvorechje. The tour will include famous landmarks: Red Square and Kremlin, St. Basil's Church, Cathedral of Christ the Savior, Novodevichiy Convent, Luzhniki, the White House, Moskva River and others. You will drive to the Sparrow Hills, 6 km south-west of the Kremlin, topped by the Moscow University skyscraper, for the best panoramic view of the city. 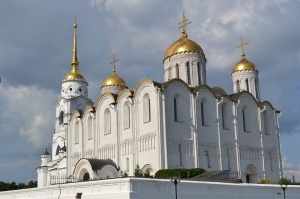 During the tour you will visit Novodevichiy Convent founded in 1524 and proclaimed UNESCO World Heritage site in 2004. 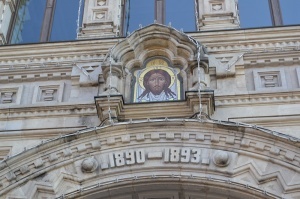 The convent has sheltered many famous Russian ladies such as Irina Godunova (the sister of Boris Godunov), Sophia Alekseyevna (sister of Peter the Great), Eudoxia Lopukhina (first wife of Peter the Great) and others. In the afternoon you will get acquainted with the Red Square and Kremlin areas. This is where you will see the famous St. 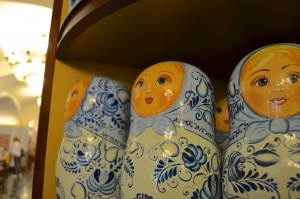 Basil's Cathedral, Mausoleum, Historical Museum and GUM store. Inside Kremlin the main landmarks are three Cathedrals - Assumption, Annunciation and Archangel - dated back to the 15-16th centuries, Ivan the Great Bell Tower, Tsar Bell, Tsar Cannon, Hall of Facets and Terem Place. Between the Armory and the Annunciation Cathedral is the Great Kremlin Palace the official residence of Russian president. 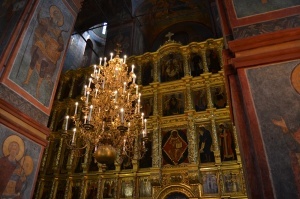 Your tour will include a visit to the Armory - a stunning collection of wealth and treasures accumulated by Russian state and church over the centuries. 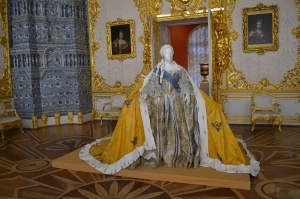 The collection includes royal regalia, Faberge Eggs of precious metals and jewels, the 800-diamond throne of Tsar Alexey, the jewel-studded and sable-trimmed gold Cap of Monomakh worn for coronations for two centuries, the coronation dress of Catherine the Great, the sleigh in which Elizabeth rode from St. Petersburg to Moscow for her coronation pulled by 23 horses at a time. The driver and the guide will pick you up in the morning. Your Russian travel adventure continues to Suzdal, 130 miles northeast of Moscow. Suzdal is an Old Russian town of the Golden Ring dating back to the 11th century. You will be invited to tour and have Russian cuisine lunch in the local farmer's house followed by the City tour of Suzdal. It is a well-known tourist center with many remarkable riverside churches and monasteries dating back to the 11th - 13th century, some of them are famous landmarks of the Old Russian architecture included in UNESCO World Heritage List, and has the look and feel of a small provincial town with beautiful landscape and rustic unpaved roads and houses. The scenery is very picturesque and Russian, tranquil and quite different from Moscow. During the tour you will visit Kremlin with Krestovaya Chamber, the Wooden Architecture Museum and Savior Monastery of St. Euthymius with Transfiguration Cathedral. Overnight in Suzdal. After breakfast transfer to Vladimir located on the river Klyazma, 124 miles to the east of Moscow. One of the medieval capitals of Russia, today modern Vladimir is part of the Golden Ring of the ancient Russian cities. Its three main monuments are on the UNESCO World Heritage List: the magnificent five-domed Assumption Cathedral, Cathedral of St. Demetrius and the Golden Gate. You will see all three of them. 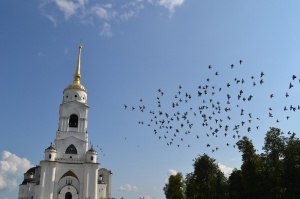 Continue your driving tour to Sergiev Posad with a photo stop in Pereslavl Zalessky. Russian cuisine lunch upon arrival followed by a tour of the Trinity Monastery of St. Sergius. Sergiev Posad is one of Russia's most important religious and historic landmarks, a place of pilgrimage of the Russian Orthodox Church and one of the most interesting museums, where one may find the icons of Andrei Rublev and other famous masters of the 15th-18th centuries. Return to Moscow for an overnight train to St. Petersburg. Meet your guide at the train station and begin City Tour of St. Petersburg. St. Petersburg is one of the most fascinating cities in Europe. You will drive by the elegant buildings on the Nevsky Prospect, stately palaces on Palace Embankment along the Neva River, Palace Square with Winter Palace and Alexander Column, Bronze Horseman - the famous monument to Peter the Great, Admiralty, Schmidt Bridge, Strelka with Stock Exchange and Rosstral Columns, St. Isaac's Cathedral, Peter and Paul Fortress, Alexander Nevsky Lavra, Canal Griboyedova, Fontanka, Kazan Cathedral, Church on Spilled Blood and other finest architectural, historical and cultural landmarks. During the tour you will visit Peter and Paul Fortress and St. Isaac’s Cathedral. St. Isaac's Cathedral is one of the world’s largest Cathedrals and can accommodate about 10,000 audiences. It was designed by then unknown Auguste de Montferrand and opened in 1858. The Cathedral is beautifully decorated inside with marble of 13 colors, malachite, lapis-lazuli, paintings, mosaics and stained glass made by the most famous Russian artists. Today you will enjoy a private tour of one of the nation's main glories - the State Hermitage Art Museum. It occupies six magnificent buildings situated along the embankment of the Neva River, right in the heart of St Petersburg. The leading role in this unique architectural ensemble is played by the Winter Palace, the residence of the Russian tsars that was built according to the design of Francesco Bartolomeo Rastrelli in 1754-62. This ensemble is extended by the eastern wing of the General Staff building, the Menshikov Palace and the recently constructed Repository. Put together throughout two and a half centuries, the Hermitage collection consists of over 3,000,000 works of art and presents the development of the world culture and art from the Stone Age to the 20th century. In the afternoon you are free to continue exploring the Hermitage on your own or enjoy St. Petersburg. Tour to Petergoff (formerly known as Petrodvorets), located on the southern shores of the Finnish Gulf 14 miles (29 kilometers) away from St. Petersburg. The history of Petergoff began in 1704 when Peter I built a wooden house on the Gulf while overseeing the construction of the nearby Kronstadt Fortress. In 1713 he began transforming the area into an imperial residence. The Grand Palace was inaugurated in 1723 and later expanded by Empress Elizabeth. The Palace is surrounded by a beautiful park famous for its fountains. There are 144 of them, all operating without the use of pumps by a combination of naturally generated water pressure and magic. Each fountain is unique and once you step in the kingdom of fountains you will be surprised by this splendid beauty created by a man. Tour to Pushkin and Pavlovsk located 25-30 km from St. Petersburg. Pushkin's palaces and parks were created under Empresses Elizabeth and Catherine the Great between 1744 and 1796. The main landmark is the Catherine Palace designed by Rastrelli and named after Elizabeth’s mother, Peter the Great's second wife. Pushkin's original name is Tsarskoye Selo (Tsar's Village). It was renamed in 1937 after Russia’s famous poet who used to study here. Pavlovsk’s park of woods, lakes and rivers, valleys and avenues, classical statues and temples is one of the most exquisite. The Great Palace is the centerpiece of Pavlovsk. It was designed by Charles Cameron between 1781 and 1786 on Catherine the Great's orders for her son Pavel, the future Paul I.
Half-a-day tour of the Yusupov Palace located on a quiet stretch of the Moika River. This long yellow building once was a residence of the wealthy and respected Yusupov family and served as a stage for one of Russian history's moments of high drama - the murder of Grigory Rasputin, a peasant who had gained control over the tsar's family through his alleged supernatural powers. The Palace is notable for its lavish interiors, the exotic Moorish Room, the elegant Rococo style Theater and Rasputin Cellars where “the holy man” Grigory Rasputin was murdered by Prince Felix Yusupov. Free afternoon. Today you will visit the State Russian Museum - the world's largest collection of Russian art. The museum is housed in the former Mikhailovsky Palace designed by famous Carlo Rossi. The Palace was built for Grand Duke Mikhail, brother of Tsars Alexander I and Nicholas I as a compensation for not being able to have his time on the throne. The collection numbers some 400,000 works and covers the entire history of Russian fine art from the tenth century to the present day. It reflects virtually every form and genre of art in Russia, including a unique collection of Old Russian icons, works of painting, graphic art and sculpture, decorative and applied art, folk art and numismatics, as well as the world's finest collection of Russian avant-garde. Free afternoon. Dear Alex, I wanted to tell you how much I enjoyed my trip to Russia. I learned so much about the history of Russia and the Russian people. Your agency has put together a trip that I would recommend to anyone. The knowledge, information and insights into the Russian culture by the tour guides (Olga in Moscow) and Maria (Novgorod and St. Petersburg) made this trip such a special experience that I will never forget it. This trip far exceeded my expectations.